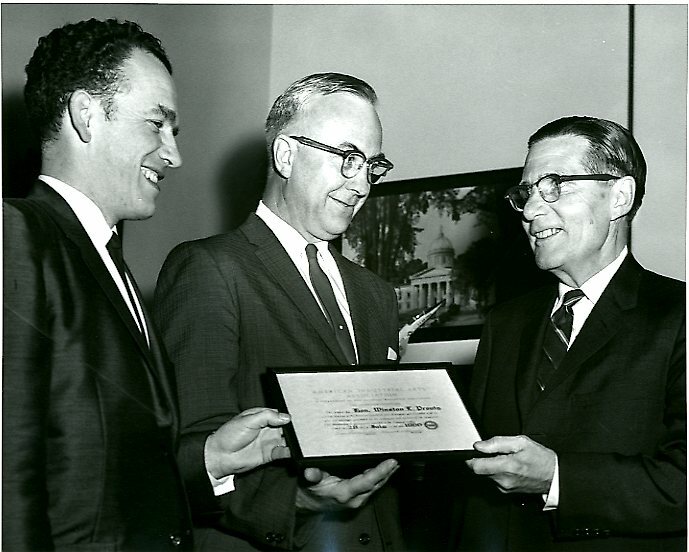 Senator Winston L. Prouty (R. - Vt.) right, receiving a Certificate of Life Membership in the American Industrial Arts Association in recognition of his successful sponsorship of a program of Federal Assistance to Industrial Arts Education. Making the presentation are, left, Dr. Howard Decker, Executive Secretary and Dr. John Conaway, Chairman of the American Industrial Arts Association. Prouty, Winston L. (Winston Lewis), 1906-1971. "Photograph of Winston L. Prouty and representatives from American Industrial Arts Association." Photograph, Winston L. Prouty Papers, Personal, Carton D38, Folder 6, Special Collections, University of Vermont Libraries. Accessed 20 April 2019. http://acsc.lib.udel.edu/items/show/350.